One of the cities that saw a lot of hail damage Wednesday night is Plano. 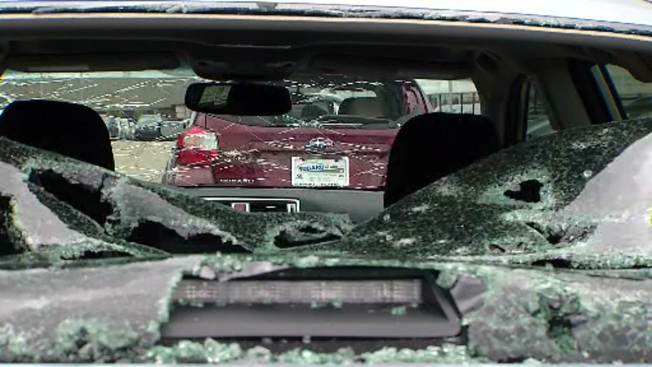 In a neighborhood near West Park Boulevard and Ohio Road, there were several vehicles with knocked-out windshields while other nearby vehicles were spared. There was also significant tree debris from the hail in the form of leaves and branches scattered across roadways. At the Courtyard by Marriott at West Plano Parkway and Preston Road, more than a dozen vehicles took direct hits from the hail. "It looks like a war zone out here," said Matt Fealey. The morning's sun rise brought to light the damage from Wednesday night to many hotel guests. Car after car in the parking lot featured shattered rear windows, dented hoods and cracked windshields. "A little bit disappointed, a little shocked, obviously heard the hail coming down last night," Fealey said. "I didn't think it would do damage like this." Fealey, who's from New York City on business, didn't hear any glass breaking during the storm, but sure enough that's what happened to his rental car. It's a lesson that in Texas everything is bigger. "The hail is too that's for sure," he said. In a neighborhood near Hightower Elementary School we found Bruce Johnston on his roof taking pictures of the damage. "About 10 o'clock it started hailing, about golf ball-sized hail," Johnston said. "We had three skylights get knocked out here and we had hail inside the house." Having lived here since 1981, Johnston could only recall one other hail storm this severe. However, he said his home didn't get damage nearly as bad as some of his neighbors. "Some people that had cars out here had a lot of damage on their windows that I've seen this morning," Johnston said. "I feel sorry for them." People like Matt Fealey, who'll have to spend part of his business trip dealing with the damage. "Pretty wild," he said. "So I'll go get this checked out now. Nothing you can do about it." Most of the cars damaged at the hotel were rental cars.